White's survival on the open-skirted top is a big question. White 1 is indecisive and poor. It forms half an eye but it was better to keep connected to the stone on the right. Black 2 cuts off the stone. White replies with 3 and Black 4 puts pressure on White 3. Black 8 is too confident that the group at the top is dead. Black wants to take the two white stones. The truth is, however that such captures are usually gote, so white will have an opportunity to do something. 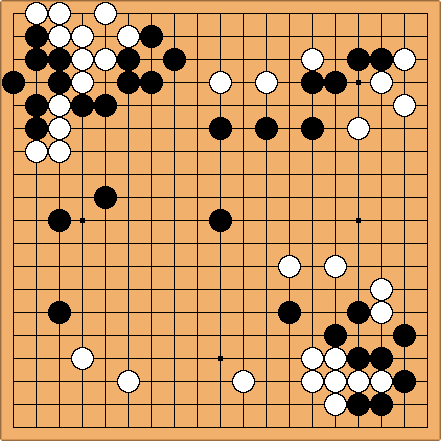 White sees that if Black continues with the plan white will have a move at the top. So, now White gambles on making the capture of two stones as difficult as possible. Those two stones have a much lower value than the life of the group at the top. White plays 9 and Black 10 continues this small capture maneuver with a cut.